Becca Jones-Starr, the creator of Bite The Dust, was born on January 19th 1985 in San Diego County California. Although they were born generations too late, they very soon connected with the biggest passion of their life: rock and roll music. Throughout their life they performed often as David Bowie, attended numerous concerts standing in the front row, and dedicated just about every aspect of their life to rock music. Becca is a rock and roll webmaster, maintaining The Gits website (now a Fan Site) and working with many other bands. 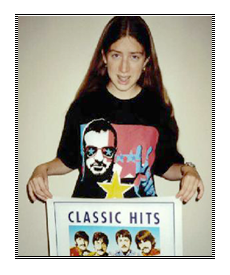 "My life was saved by rock and roll" says Becca, who created the name "Becca Jones-Starr" after "the two people she would take to the prom"; Davy Jones and Ringo Starr. "My favorite guys were Ringo and Davy, they were also the ones that guided me into the rock and roll world. My first concert was The Monkees and I was serenaded to by Davy Jones. That set up this hungry rock and roll-loving precedent of going to live concerts and meeting famous people. My second show was Ringo Starr, after that I knew who I was and who I wanted to be." she explains. "I knew in order to create my own identity, I had to change my name. I liked the sound of 'Jones Starr' because it sounded like 'lone star' which I always felt like I always did my own thing." they continues "I've been going by that name since the age of 15." On April 12th 2013 the name change became official. Becca Jones-Starr is considered by some to be the new Riff Randell. Not only are they totally into rock and roll, they are also totally in love with Joey Ramone. They have an "Alice Cooper-like" view on their name and gender (the rest of the bio will explain). They even has a deep voice, which makes them feel like Bea Arthur sometimes. A lot of people have compared them to Daria. Their all time favorite band is QUEEN. Some know Becca for having a Joey Ramone tattoo with angel wings on her back. All of the tattoos Becca has are rock and roll related. Their also known for her constantly changing hair styles. Concerts and events are a big part of Becca's life, they constantly go to local SF Bay Area shows and travels to New York almost every year for Joey's Ramone's annual Birthday Bash. In 2003 Becca opened Bite-the-dust.com, a music site to meet more like-minded people. Since 2003 Bite The Dust has connected with over 1,900 fans and most importantly Dylan Overstolz and Sean King, whose music knowledge at a young age earned her respect. They quickly made them contributors to the site (and all related projects). In 2009 Rock & Roll Headquarters was established in Emeryville, California. Then in January 2011 Becca started Rockast: The Rock and Roll Podcast after discovering there weren't many rock themed podcasts on the internet. They also claims to have been "really dissapointed by terrestrial radio" and decided to make her own station. "I reached a point where I wasn't seeing things that interested me. So I decided to simply make my own." After returning to school in early 2011, Becca graduated with honors from graphic design school in the Bay Area. They soon got a job as an Art Director and became the designer of the packaging and web work for an organic baby clothing boutique. A lot of web and graphic related jobs followed. In the fall of 2011, Becca became a regular performer with the drag king troup "The Rebel Kings." Her drag name "Lou Weed" is obviously taken after Lou Reed of the Velvet Underground. "Lou Weed's two favorite things are rock and roll and smokin' a doobie" All the performances are rock and roll themed, including The Jam's "Going Underground", David Bowie's "Watch that man", and Billy Joel's "It's still rock and roll to me." 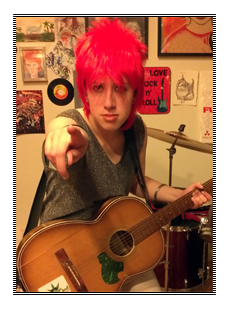 On February 2014 on the same day Ziggy Stardust retired so did Becca's Lou Weed character. During this time, Becca came out to her friends as transgender, admitting "I have unorthodox views on gender and sexuality, I know that. I always felt equally both genders and don't view it as a black or white kind of thing. Pronouns don't matter. I don't mind being called a male or a female because I find neither of them insulting. If I had to lable it I'd go with David Bowie's definition of "Third Gender. I'm choosing to be who I am, even if it's confusing to most people. Since coming out about my feelings, my life has been so much better." 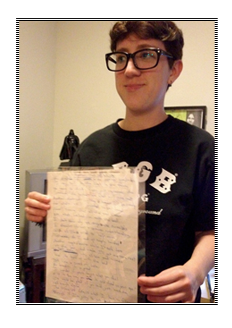 Read more about Becca's gender identity. Currently Becca is really into rock and roll tribute bands, which the Bay Area is full of. Making a lot of new friends and getting to experience almost every Club/venue in the SF Bay Area. "Too bad I can't substitute music for air and water." In early June of 2012 her album artwork debuted on Romper's new CD "Sifting through the rubble." In the Fall Becca finished Wendy Flower's album art for her new record. Also debuting in Fall 2012 was the new Broken Rekids website. 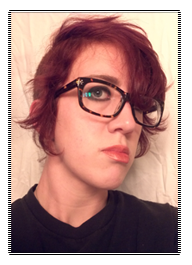 At present, Becca currently maintains The Gits website and store and is doing sites for local Bay Area businesses. Becca primarily works with bands, music stores and record labels in the San Francisco Bay Area, helping them sell their merchandise, social network and sending out newsletters. Musicians choose to work with them because they are passionate about music and can relate do what they're doing. Becca Jones-Starr's Band Promotion helps Bay Area bands, tribute bands and cover bands spread the word about their music and upcoming shows. Becca currently lives in Emeryville with her fat cat Manny. They are quite into creating guitar pick art & jewelry. Current hobbies include: cataloging my music collection, gardening, and making ideas a reality. To see what Becca is up to, mostly pretaining to rock and roll and their graphic design work, check out the Projects page. Be sure to also check out the music blog Fiberglass Jacket!